For the main settlement, see Wigan. 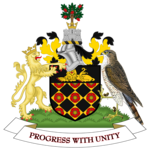 Wigan metropolitan borough was created on 1 April 1974 by the Local Government Act 1972. It was formed from the former county borough of Wigan along with other local government units from the administrative county of Lancashire. These were the Municipal Borough of Leigh, the urban districts of Abram, Aspull, Atherton, Hindley, Ince-in-Makerfield, Orrell, Standish and Tyldesley. Ashton-in-Makerfield except for the parish of Seneley Green, the Golborne Urban District except for the parish of Culcheth and Glazebury in Warrington, the Higher End part of Billinge and Winstanley Urban District and the civil parishes of Haigh, Shevington and Worthington from the Wigan Rural District were included. Wigan borough covers an area of 77 square miles (200 km2) and is the 9th largest metropolitan borough, out of 36, in England. The borough is the most north western in Greater Manchester. Within Greater Manchester, it borders the Metropolitan Borough of Bolton to the north-east and east, and the City of Salford to the east. Outwith Greater Manchester, in the south it borders Warrington (a unitary authority in Cheshire); to the south-west it borders the Metropolitan Borough of St Helens in Merseyside. To the west it borders the West Lancashire borough, and to the north it borders the Chorley borough, both in Lancashire. Wigan has seven Local Nature Reserves: including Wigan Flashes LNR, Borsdane Wood LNR, between Hindley and Aspull, Greenslate Water Meadows LNR within Orrell Water Park in Orrell, Low Hall LNR between Hindley and Platt Bridge, Pennington Flash LNR, Kirkless LNR at Ince and Three Sisters LNR, Ashton-In-Makerfield. See also: Mayor of Wigan. For 12 years after the county was created in 1974, the borough had a two-tier system of local government, and Wigan Council shared power with the Greater Manchester County Council. The county council was abolished in 1986 by the Local Government Act 1985. In April 2011 the Greater Manchester Combined Authority became the top tier of local government within Greater Manchester covering ten boroughs including Wigan. The first elections to the borough council were held on 10 May 1973. The Metropolitan Borough Council is divided into 25 wards, each of which elects three councillors. Elections are by third, with one councillor from each ward up for re-election in each election year. The borough council has a leader and cabinet system. The current leader is David Molyneux who took over from Peter Smith, who resigned in May 2018, having been leader since 1991. The council rejected the idea of a directly-elected mayor following a consultation in 2001. The Metropolitan Borough of Wigan is traditionally a Labour stronghold - the council has been Labour Party-controlled since its creation. The local elections in 1998 resulted in a council with only 2 non-Labour members. Labour had a majority with 43 seats at the 2006 election. The second largest party was the local Community Action Party which had 15 seats. Community Action first contested Wigan elections in 2002, and won 18 seats in the 2004 election following the re-warding - their councilors are for wards in the middle of the borough, between Wigan and Leigh. The Conservative Party had nine seats, and the Liberal Democrats eight. At the 2008 elections Labour was the largest party with 41 seats out of a total of 75, the Conservative Party had 14 seats, Community Action Party 8 seats, Independent 7 seats, Liberal Democrats 4 seats and one was vacant. As of November 2010 (after May elections), Labour was the largest party with 51 seats out of a total of 75, the Conservative Party had 8 seats, 7 Independent, Community Action Party 4 seats and Liberal Democrats seats (1 member currently suspended) and the 'Independent Conservative' members with 2 seats. As of June 2011 (after May elections), Labour continued to be the largest party with 58 seats out of 75, the Independent Councillor group with 8 seats form the official opposition, the Conservative Party had 5 seats, the Liberal Democrats hold 2 seats, Community Action Party 1 seat and 1 Independent councillor. In May 2012 (post 2012 Local Elections) the composition of the council was Labour 63 (+5), Others 9 (-1), Liberal Democrats 2 (No change)and Conservatives 1 ( -4). Presently in May 2018, the Council's political composition is: Labour 60, Conservatives 7, Independent 4, Independent Network 2, Shevington Independents 1, and Standish Independents 1. The council uses Wigan Town Hall as its main headquarters. Leigh Town Hall is used as a secondary base. Map of Wigan Metropolitan Borough's electoral wards. The borough is divided into 25 electoral wards, each of which elect three councillors. The present wards were adopted in 2003, following a review by the Boundary Commission, the previous review took place in 1979. The borough was formerly divided in 24 wards. Wigan Council has divided the borough into ten areas by the name of townships, with a Township Manager and a Township Forum each. The borough has three civil parishes: Haigh, Shevington and Worthington. The rest of the borough is an unparished area. Ecclesiastical parishes in the west of the borough are part of the Anglican Diocese of Liverpool and the Roman Catholic Archdiocese of Liverpool, Anglican parishes in the east of the Metropolitan Borough are part of the Diocese of Manchester and the northern section part of the Diocese of Blackburn. The Wigan Metropolitan Borough is currently covered by four parliamentary constituencies, Wigan, Makerfield, Leigh, and Bolton West. (Atherton is the only Wigan ward included in Bolton West, with the rest of the constituency made up of wards from Bolton Borough). New constituency boundaries recommended by the Boundary Commission for the 2010 UK election saw the link to Salford broken by the removal of Wigan areas from the Worsley constituency. This resulted in the Worsley constituency wards of Tyldesley and Astley-Mosley Common being placed in the Leigh Constituency with the Atherton ward becoming part of Bolton West. Makerfield is the only constituency to have returned Labour MPs continuously since 1906. Wigan council's new coat of arms is based on various elements from the arms of the councils of its predecessor districts. With a population of around 300,000, Wigan is the second most populous borough of Greater Manchester, after Manchester. It has one of the lowest ethnic minority populations, with the 2001 census reporting 98.7% of the population as white. Unemployment is around the average for England and Wales. Approximately 9.5% of the population was recorded as being permanently sick or disabled compared to a national average of 5.5%. The table details the population change since 1801, including the percentage change since the last available census data. Although the Metropolitan Borough of Wigan has existed since 1974, figures have been generated by combining data from the towns, villages, and civil parishes that became constituent parts of the borough. The population of the borough has remained roughly static since the 1970s at around 300,000, second to Manchester within Greater Manchester. Public transport in Wigan MBC is co-ordinated by Transport for Greater Manchester (TfGM). The borough is served by an extensive bus network with most services operated by Stagecoach Manchester, Arriva North West First Greater Manchester and Diamond Bus North West. Wigan town centre is the main hub of the bus network with and has Wigan bus station. Leigh is a secondary hub also with a bus station. Services operate from the bus stations to Bolton, Manchester, The Trafford Centre, St Helens and Chorley, as well as local inter-urban routes, with three high frequency services between Wigan and Leigh bus stations, operated by Stagecoach Manchester. Several railway lines cross the borough. Wigan Wallgate railway station is served by Northern trains on the Manchester to Southport and Kirkby lines. There are services to stations towards Manchester, serving all city centre stations including Manchester Victoria and Manchester Piccadilly via two routes: one through Bolton and one via Atherton, with connections to other local and national destinations. Wigan North Western railway station is on the West Coast Mainline served by Northern and Virgin Trains. There are services to Liverpool Lime Street, Blackpool North, London Euston, Birmingham, Glasgow and Edinburgh. Other stations in the borough are Atherton, Hag Fold, Bryn, Gathurst, Hindley, Ince, Orrell, and Pemberton. Appley Bridge railway station just outside the border with West Lancashire is managed by TfGM and serves the far north-western part of the borough. There is a campaign for Golborne railway station to be re-opened. Leigh is one of the largest towns in the UK without a railway station. Westleigh station, on the Bolton and Leigh Railway, closed in 1954. Leigh and Tyldesley stations on the Tyldesley Loopline were closed in 1969. There is a Guided busway located in Leigh which goes from Leigh to Manchester via Tyldesley towards Manchester as a guided busway but this not universally popular. The Leeds and Liverpool and Bridgewater canals meet in Leigh town centre. The M6 motorway crosses the west of the borough, and serves Ashton-in-Makerfield at junctions 23 and 24 (north only) and 25 (south only), Wigan at junction 25 (south only), Wigan/Orrell at junction 26 and Standish junction 27. The M58 motorway, to Liverpool, terminates at junction 26 of the M6 near Orrell. The dual carriageway A580 East Lancashire Road linking Liverpool to Manchester crosses the south of the borough. The Metropolitan Borough of Wigan has one twin town in France. ^ a b Local Government Act 1972. 1972 c. 60. HMSO. ^ Local Government (Successor Parishes) Order 1973. 1973/1110. HMSO. ^ "MORI local government and identity opinion poll December 2003 - February 2004" (PDF). The Boundary Committee for England. Retrieved 2007-02-11. ^ "Three major parties find cause for satisfaction in local election results despite low poll". The Times. 1973-05-12. ^ "Executive Leader - David Molyneux". Wigan Metropolitan Borough Council. ^ "Cllr David Molyneux announced as new council leader". The Bolton News. ^ "GMC Lord Peter Smith". Greater Manchester Combined Authority. ^ "Borough rejects elected mayor" (Press release). Wigan Metropolitan Borough Council. 2001-06-15. Archived from the original on 2002-03-06. Retrieved 2001-06-15. ^ a b "Local elections: Wigan". London: BBC News. 2006-05-04. Retrieved 2007-02-11. ^ "Labour licks wounds after polls". London: BBC News. 2004-06-11. Retrieved 2004-06-11. ^ "Summary of seats 2008". Wigan MBC. Retrieved 2010-03-01. ^ "21st century Town Hall" (Press release). Wigan Metropolitan Borough Council. 2006-08-07. Archived from the original on 2006-08-26. Retrieved 2007-02-11. ^ "Makeover for Leigh Town Hall" (Press release). 2006-06-13. Archived from the original on 2006-10-09. Retrieved 2007-02-11. ^ Final recommendations on the future electoral arrangements for Wigan (PDF). Boundary Committee. September 2003. Retrieved 2007-02-11. ^ "New Wigan Wards Map". Wigan Metropolitan Borough Council. ^ "Townships". Wigan Metropolitan Borough Council. Retrieved 2006-11-06. ^ "Greater Manchester: New Constituency Boundaries". Martin Baxter. Retrieved 2007-02-11. ^ "Safe Seats analysis". Electoral Reform Society. 2005-04-28. Archived from the original on 2006-12-03. Retrieved 2007-02-11. ^ "Census 2001 - Profiles - Wigan". Office for National Statistics. Retrieved 2007-02-11. ^ "Wigan District: total population". Vision of Britain. Retrieved on 20 December 2008. ^ "Wigan District population". Vision of Britain. University of Portsmouth. Retrieved 2007-02-11. ^ "Table KS01 Usual Resident population". 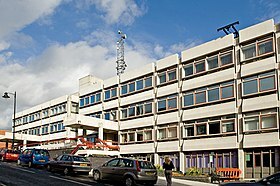 Office for National Statistics. Archived from the original (XLS (Excel spreadsheet)) on 2004-07-23. Retrieved 2007-02-11. ^ "Wigan Wallgate". National Rail. Retrieved 2010-03-01. ^ "Wigan North Western". National Rail. Retrieved 2010-03-01. ^ "WestLeigh Station". Disused Stations. Subterranea Britanica. Archived from the original on 2007-09-04. Retrieved 2010-03-01. ^ "Pennington Station". Disused Stations. Subterranea Britanica. Retrieved 2007-02-11. ^ "Leigh Salford Manchester Busway Project" (PDF). brtuk.org. Archived from the original (PDF) on 2013-05-20. Retrieved 2009-09-29. ^ "Busway, off the rails". Leigh Journal. Retrieved 2009-09-29. ^ "Town Twinning". Wigan Metropolitan Borough Council. Archived from the original on 2012-10-09. Retrieved 2007-02-11.